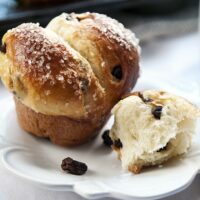 Sugar-Crusted Raisin Brioche is a special recipe using a stand mixer to make bakery-like brioche studded with raisins and sprinkled with sparkling sugar. Every now and then an irresistible temptation, usually some type of homemade bread, causes me to forsake my ususal bowl of cereal. Most recently, it was this Sugar-Crusted Raisin Brioche. At the end of last year, I worked and baked, tested and tasted as I searched for a brioche recipe that would be easy to make with a dependable outcome. I was really happy with the result. But of course, I can never leave well enough alone, so I invented this variation with raisins. Combine the buttery flavor of brioche with the sweetness of raisins and the crunchiness of sparkling sugar for a breakfast or brunch treat that will cause you to forget about your usual bowl of cereal. Sanding sugar provides the finishing touch. You must mix the dough the night before. Let it rise on the counter for a couple of hours. Then chill for at least 6 hours or overnight in the fridge. Let your stand mixer do the kneading. Moreover, the dough is simple–a dump and mix proposition with no guesswork involved. You don’t have to knead by hand. See my post, No More Lopsided Brioche (A Beginner’s Guide) for pictures of the kneading process in the mixer. For rolls that look like those pictured, divide dough into 24 equally-sized portions after the overnight chill, then roll into balls. 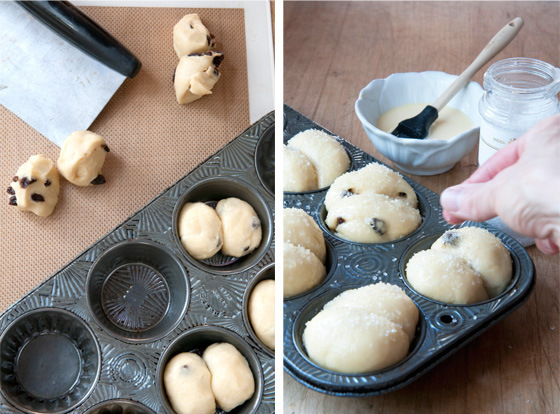 Place two balls side-by-side in each cup of a muffin pan. Next, allow the formed rolls to rise for about 2 hours. Finally, glaze and sprinkle rolls with sugar and bake. Form balls, let rise 2 hours, brush with glaze and sprinkle with sugar. 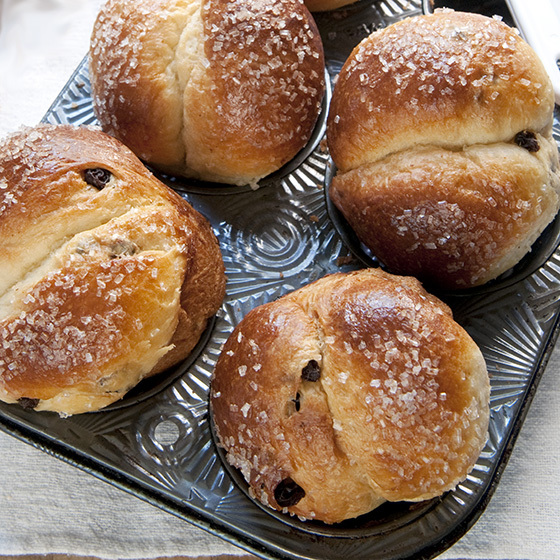 Easy recipe using a stand mixer to make brioche studded with raisins and sprinkled with sparkling sugar. 1 egg + 1 tablespoon heavy cream whisked together well. Add all ingredients to mixing bowl of stand mixer and set speed on LOW until flour is moistened. Increase speed to just below MEDIUM and set the timer for 15 minutes. You can pretty much walk away during this time. When ready, dough with be shiny and elastic and the bowl will be clean with all dough sticking to the paddle. Add raisins and mix until evenly distributed. Dough should be allowed to rise for 1-1/2 to 2 hours in warm place immediately after mixing and kneading. Then gently release dough from the sides to remove some of the air. Cover bowl and place in refrigerator for 6-24 hours. Do not skip this part. If you don't have time for the chill, you might want to make another kind of bread. Remove dough to lightly-floured board (or use a silicone baking mat, no flour needed) and mold into a large ball. Cut in half. Cut each half in half. You should now have 4 pieces. Cut each of those in half (giving you 8 balls) and then cut each of those in thirds giving you a total of 24 balls. ">Roll all portions into little balls. Place two balls in each hole of a well-greased muffin tin. Cover all with tea towels and allow to rise in warm place until almost double. This may take 1-2 hours. When rolls have almost doubled in size, brush with glaze taking care not to let glaze pool at the edges between the dough and the mold. Place muffins pans on cookie sheet to keep the bottoms from over-browning. Preheat oven to 425 degrees. Then reduce temperature to 375 degrees and bake rolls for about 15 minutes. Loosely cover rolls with foil if tops are getting too dark. Internal temperature should reach 185-190 degrees. Remove from oven and allow to cool for a couple minutes before turning out onto a cooling rack. Best eaten the same day but also good toasted the next day. Could you tell me what dry milk is? Is this milk powder? Is it full fat or low fat? Have you tried making this recipe without the dry milk or with liquid milk instead? 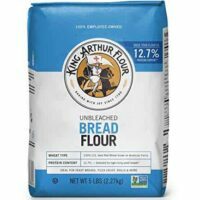 I am looking forward to making this using my apple cinnamon bread flour. Yes, dry milk is the same as powdered milk. Here in the states, it is nonfat. 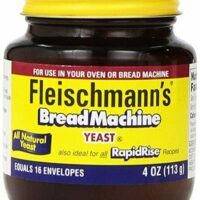 Powdered milk helps the bread stay fresh a little longer. Have not tried it without. I lost my grandma recipe a long time back, and I couldn’t enjoy eating a brioche since then, until I tried your recipe, I am notvery good in baking but as it was very well explained, I did a great job, your brioche returned to me the wonderful childhood memories. Thank you for changing my mood and making my mornings brighter. You’re welcome. Thanks for writing. It is so much fun to recreate food memories like your grandma’s bread. Perfecto! This was my first attempt at brioche and it turned out beautifully, thanks to your detailed instructions. I used dried currants instead of raisins, by the way: I like that they’re smaller and therefore distribute more evenly. Wonderful. I just took these out of the oven. A little hint to pass on: ABSOLUTELY let the dough chill over night. Dough with butter and sugar remains sticky. The long chill keeps it firm. To keep the marble board cold — my latest discovery — set it on top of one of those freezer gel packs, the flat kind you use to wrap a sore knee in or something. Marble stays cold, butter in the dough doesn’t start melting. One of my more brilliant improvisations………………! I like your idea, Harry. Genius way to keep your board cold if you’re using marble. I don’t have one so I just work fast. Glad you reiterated the fact this dough must be chilled. Not only does it make handling easier but it is very important to the texture and taste. Enjoy your rolls. These look beautiful Paula! I love the idea of the sugar crusting on top. I’ll have to try that next time I make brioche. Beautiful. Who wouldn’t want this for breakfast. I am diggin the sanding sugar that I can really SEE on top of the brioche. Delish!!! I eat a very predictable breakfast as well, that usually involves cereal, fruit and yogurt (but not the nifty homemade kind yet.) These little brioche rolls would be a lovely way to venture out of my rut. 🙂 They’re beautiful! These look so enticing! I’ve never made brioche, but I think I’ll give these a try. Your photo-styling skills are amazing, too. I definitely get into breakfast ruts! They usually only last a few weeks at a time, but I’ll eat essentially the same thing every day for two weeks. Lovely! The texture of these… wonderful. Off to the kitchen I go again with another Paula treasure… can’t wait to bake these up! I had to laugh at the eating the same thing for breakfast, my husband gives me a hard time about it. He calls the Kashi cereal I eat “kibbles and bits” and I do frozen blueberries on top. Only you could make me crave a raisin. I’m a huge raisin fan, and these look outstanding! Awesome, can’t wait to try them.